The Gallery at Town Center, Lake Forest Park is exhibiting a selection of works by Collage/Acrylic Artist Judith Heim and Abstract Oil Painter maëry lanahan. See these works and the creations of over 80 other local artists during Gallery at Town Center hours: Tuesday – Saturday, Noon to 5pm. Town Center is at the intersection of Bothell and Ballinger Way NE. I am a multidisciplinary artist. As a designer, the language of line and shape informs my work. As a fine artist, spontaneity is very important to me visually. Most of my imagery is influenced by the seen & unseen world around me, dream imagery, and natural forms. I decided early on, that I did not want my art to be a noun. I like to create visual metaphors and maybe even a dangling participle or two! I see it all as a celebration of the journey. I work in a variety of mediums. Collage is becoming more and more important to me as a way of expressing the colors, rich textures, shared experiences and imaginings of life. I look for common threads. I also create 3-d assemblages out of found objects and recycled treasures. The work I am submitting is from a new series utilizing the technique of “buried collage”. I apply a “crazy quilt” of collage papers, covering the substrate (wood cradle board). I isolated subject matter and paint out the negative space with acrylic paint. A lifetime resident of the Pacific Northwest, I savor the mystical beauty of the “wild lands” as well as the eclectic and slightly off-beat culture of Seattle. I think this explains the range of reflection and whimsy found in my work. There are so many hidden things going on in everyday life. So many bits of beauty that go unnoticed, so many words left unsaid. I am compelled to make art that illustrates life beyond the surface. What does a promise look like? How about a conversation between two people that lasts a lifetime? I try to feel these types of concepts on a cellular level, take them inside and make art about them. I use non-representational color and form to illustrate emotions, archetypes, psychological exchanges, or other such things that are not otherwise visible to us. Because I choose when to show gravity, perspective, color and light, I am able to emote through them. I glaze thin layers of oil paint to create rich and luminescent shapes that interrelate based on the concept I have in mind for the piece. It is my goal, as an artist, to propose these conceptual paintings as authentically as I can. I am always excited to hear how the viewers see it. In some ways it is like cloud watching, we tend to see in the clouds what is already within us. In this way, my art is about discovery. maëry lanahan was born and raised in the midwest. She received her BAE from The Ohio State University in 2000. 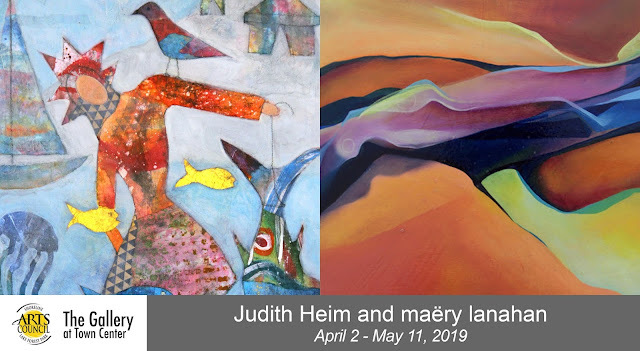 She has exhibited in Ohio and Washington and has artwork in many private collections across the U.S.
maëry lanahan now lives and works in Shoreline, Washington with her husband and 3 children. The Gallery at Town Center is a program of the Shoreline - Lake Forest Park Arts Council and is located inside the Lake Forest Park Town Center on the lower level. 17171 Bothell Way NE, Lake Forest Park, WA 98155. The Shoreline-Lake Forest Park Arts Council is a 501(c)(3) nonprofit organization whose mission is to cultivate creativity and inspire our community through the arts.